This is such an easy batter to make. First, whisk the egg whites with the sugar, cocoa powder, salt, and vanilla extract. To this mixture you add melted semi-sweet or bittersweet chocolate and dried coconut. That's it. The batter is then chilled and the cookies are baked just until they are set and shiny. The two main flavors in these cookies are chocolate and sweetened dried coconut (shredded or flaked) so choose these two ingredients carefully. Use a good quality semi-sweet or bittersweet chocolate that you enjoy eating out-of-hand. If you like you can use 3/4 cup (180 ml) semi sweet or bittersweet chocolate chips. The dried coconut should be fresh and while I like to use the sweetened variety which is made by combining coconut with powdered icing, you can use unsweetened dried coconut (shredded or flaked). 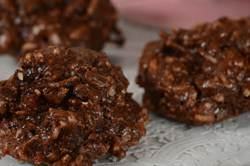 This Chocolate Coconut Macaroon recipe was adapted from Canadian Susan Mendelson's excellent book The Lazy Gourmet. Not only does she write cookbooks, but she also runs a popular catering company in Vancouver, British Columbia called 'The Lazy Gourmet'. Chocolate Coconut Macaroons: In a heatproof bowl, placed over a saucepan of simmering water, melt the chocolate. Set aside to cool to room temperature. Then, in a large bowl, lightly whisk the egg whites. Add the cocoa powder, sugar, salt, and vanilla extract and whisk to combine. Stir in the coconut and melted chocolate, making sure the coconut is completely coated with the chocolate mixture. Cover and refrigerate for about one hour or until firm. Place small mounds (a heaping tablespoons) of the batter on the parchment-lined baking sheet, spacing about two inches (5 cm) apart. Bake for about 13-15 minutes or until the macaroons are shiny and just set. Remove from oven and let cool on the baking sheet for about 10 minutes and then place on a wire rack to cool.